We visited the peaceful fishing village of Teacapán this past weekend, a beautiful place for bird watching, kayaking, fishing or just relaxing that is located a couple of hours south of Mazatlán. The biodiversity of the mangrove forest and estuary were breathtaking. The area between Escuinapa and Teacapán is scheduled by FONATUR for major development. In a few decades the Mexican government plans for this charming and pristine area, teeming with wildlife, to look a lot like Cancún. This of course breaks our hearts, but it seemed to be excellently good news to most of the locals with whom we spoke. Development for them means jobs, income, food, and a better quality of life. To us, it means destruction of the incredible mangrove ecosystem, estuary and bird habitat, very similar, no doubt, to how Mazatlán’s Golden Zone looked in the 1950s, before the estuary here was filled in, the mangroves destroyed, and the hotels built. 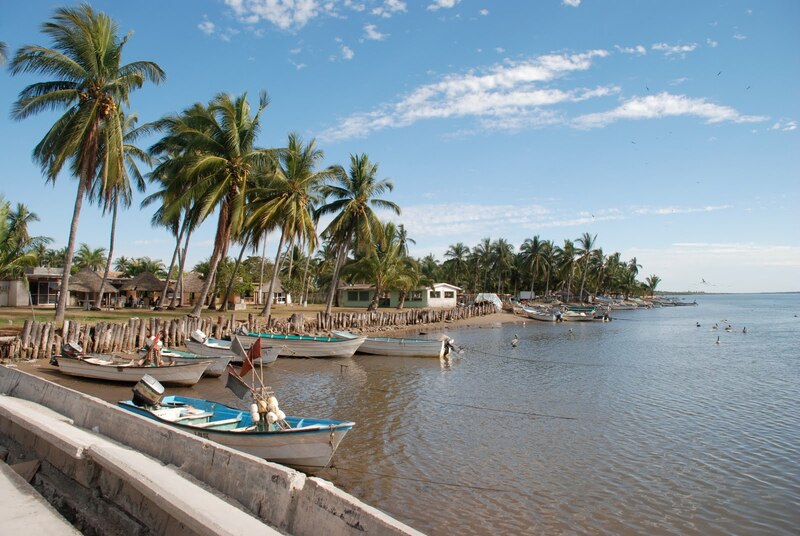 The estuary or lago as those in Teacapán called it, is filled with fish, oysters, crab, and shrimp. The drive from Mazatlán to Teacapán is very easy. You take Highway 15 (toll or free road) south through Villa Unión to Escuinapa (88 km from Mazatlán), then turn onto Highway 1 along the coast to Teacapán (another 40 km). The latter highway has its share of potholes. The vista on the journey is excellent. We made a very quick trip, arriving on Sunday afternoon and returning on Monday evening due to the holiday. We were told Teacapán has 6000 inhabitants. It lies right on the border between the states of Sinaloa and Nayarit, though it is part of Sinaloa. It is built around a central plaza which has the traditional band stand and a quaint church. Looking from town, you can see what looks like an inlet/outlet to the ocean, but mostly you look at the calm lago (which is really a 30 mile long estuary) and beyond that the island. Thus, you don’t hear crashing waves as you would on a more usual bay. The valley is rimmed with mountains, so it’s a very gorgeous view. One of the main mountaintops is said to look like a man’s face. The locals say it looks like George Washington. Our hotel (María Fernanda) was clean, bright, affordable, had two pools and a restaurant, and the shower had hot water. It was located right on the water with beautiful views. There was wireless internet in the lobby but not in the room. The town seemed to have very few formal restaurants. We ate in the hotel; there was another restaurant run by a Canadian right next door (Wayne’s), and a family-owned palapa restaurant was just down the malecón. We saw was a cocina económica on the plaza, and various more informal eateries and botaneros on the main road into town. We ate a wonderful pescado zarandeado for dinner the day we arrived, and there were crab, prawns, and scallops galore. We bought some fresh prawns and crab meat to bring home with us for dinner; yum! The mangroves of Teacapán are a famous bird watching area, home to 250 species of birds. 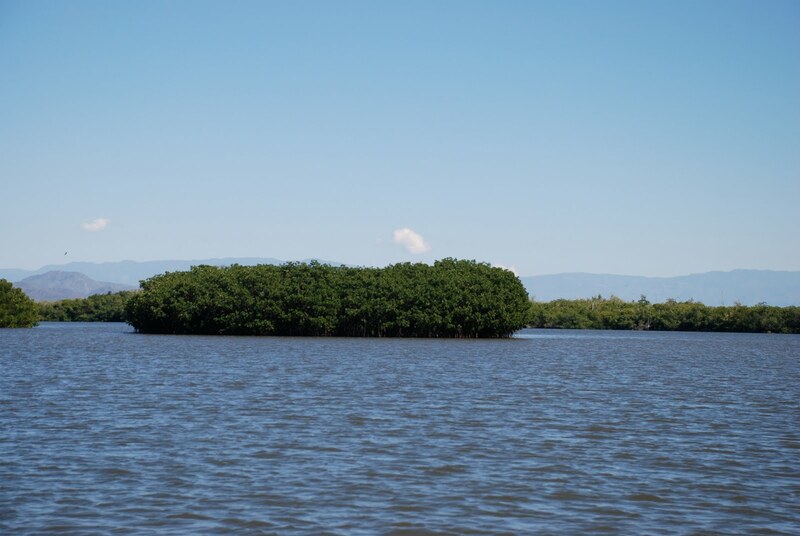 The Marismas Nacionales are the largest coastal mangrove area on Mexico’s Pacific coast. We saw great herons, and little blue herons, white herons, cranes, lots of osprey, roseated spoonbills, cormorants, a fairly unusual bird called a boot-billed heron (I believe), flycatchers, and a host of other birds big and small, including the usual gulls, pelicans and frigate birds. We found a terrific guide, Victor Méndez Denis (tel 695-954-5386). He told us he is licensed by the federal Department of Tourism as an ecotour guide, the only one in town. He has a very nice, clean, covered boat with a very quiet motor that holds about 15 people. When he told us he could talk to the birds we thought he was joking; we laughed and called him Dr. Doolittle. But, indeed, Victor called quite a few birds, and seems quite adept at calling. I’m confident most birders would be thrilled. He took us on a cruise out to “the other side,” Bird Island and a few other places, and we found him to be very knowledgeable. He explained to us that four out of the seven kinds of mangroves in the world can be found in Teacapan: black, white, red and button. The red mangroves are especially plentiful, extending their roots down into the water to form a “reef” in a very similar manner to the way in which coral grows. This reef teems with wildlife: birds in the tree branches, crabs and all sorts of aquatic animals among the tree roots. We were told there are cayman in the water, but we did see quite a few people snorkeling, either oystering or spearfishing. 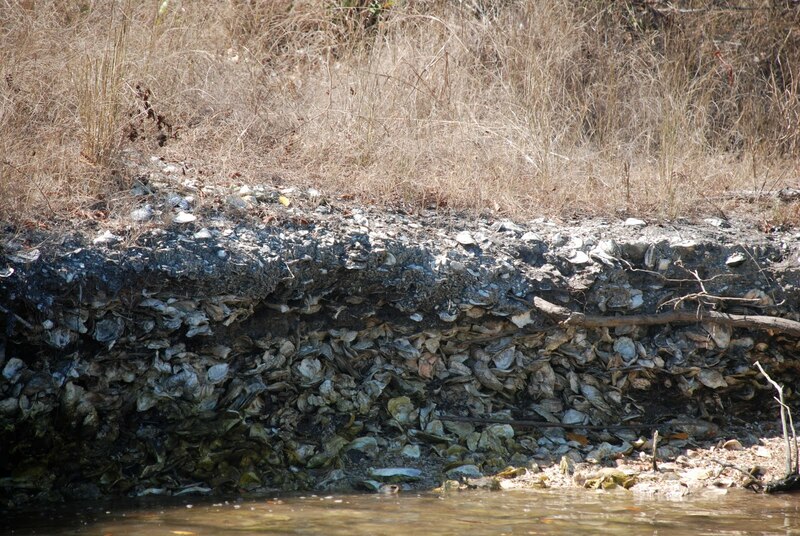 In quite a few areas along the “other side,” the island, there are oyster shell mounds, said to be the remains of oysters harvested by native people over 4000 years ago. Some say they are burial grounds. The mounds are extensive. There are loads of oysters to be found in the fresh water here. They are easy to harvest, too; not like the rock oysters in the ocean off Mazatlán, which require the divers to hammer and chisel. The Teacapán oyster divers that we saw only used their hands. Our guide, Victor, bought 10 kilos of fresh oysters for 150 pesos. Quite a great deal, we thought. He tells us they are much sweeter and better than the rock oysters. 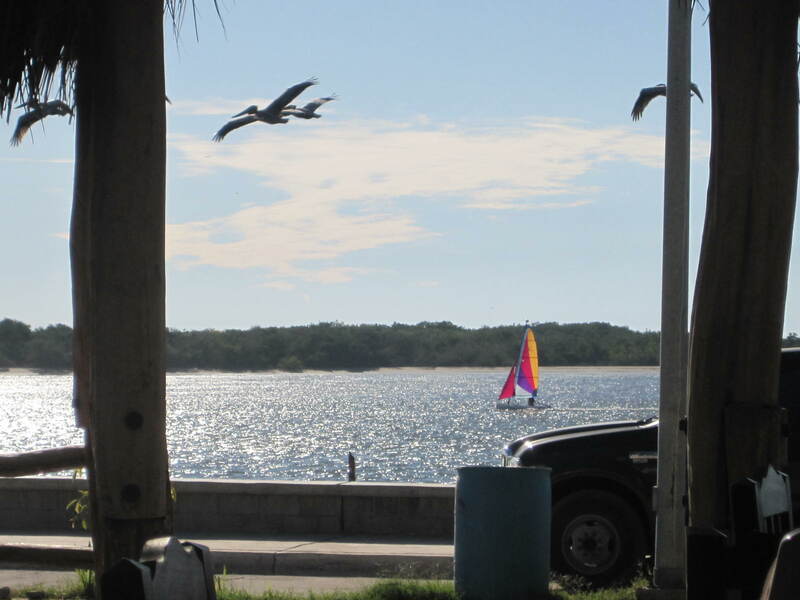 The fishing tours advertise fishing for snook, red snapper, grouper, sea bass, trigger fish, jack crevalle. Next time we go, we’d like to tour the estuary at low tide. Victor told us many of the islands in the estuary actually become connected at low tide, and the birds come out from the mangroves to eat on the sand bars. Would definitely like to see that! Would also like to rent a kayak and glide through the mangroves; it would be gorgeous. I’d like to get out to the beach. Seems to me you should be able to take a boat out around the peninsula and access the beach that way, rather than making the long drive. But, as we didn’t do that, I am not sure. Isla Isabel is a couple of hours boat ride from Teacapán. We could also go from Mazatlán. I have long wanted to go to this national park to see the blue-footed boobies. People call it a miniature Galapagos, nearby here in the Islas Marias. It is one of the main seabird nesting areas in the Pacific, with 92 bird species recorded. There is also good snorkeling. Due to CONANP protection, a visit means you must be accompanied by a licensed guide, and I believe you have to camp if you want to stay overnight. What a great post about a beautiful place. When the news first came out about the proposed development there we met a woman who lived there and asked what she thought about it… and she was all for it. I guess that employment trumps ecology around here. My hope is that the plans for the development will fizzle out somehow.Thanks for all the information, we will head that way very soon! Welcome home soon, Anonymous! I trust you find a terrific job and enjoy being back in Sinaloa. Thank you for the post, Dianne. We're planning a trip to Teacapan in February, and it's exactly the information I was looking for. So glad you found the post helpful, Janice. Enjoy your trip! Teacapan is a beautiful place!